WE DID SAY A WOOD BURNING POOL HEATER COMBINED WITH A WOOD BURNING PIZZA OVEN. The WSP Pizza Silverdome is a patent pending wood burning pool heater combined with a wood burning pizza oven. There is no other product on the market like this. While you are heating your pool (approximately 1 degree per hour) you and family can truly enjoy the backyard cooking experience. 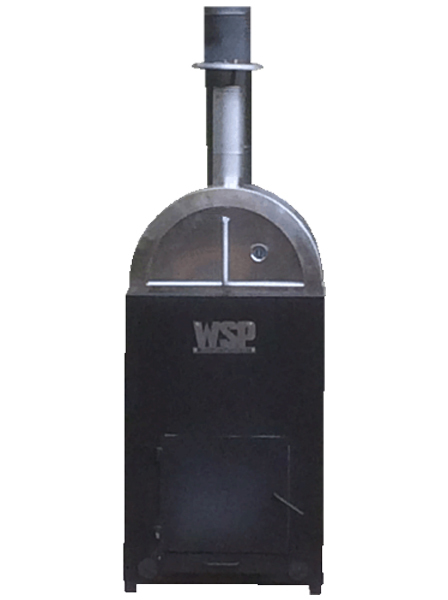 This WSP Pizza Silverdome incorporates our water jacket technology and over 150 linear feet of stainless steel tubes. This wood burning pool heater packs a big punch and produces delicious food. The Pizza Megadome is also a patent pending wood burning pool heater combined with a wood burning pizza oven. There is no other product on the market like this. While you are heating your pool (approximately 1 degree per hour) you and family can truly enjoy the backyard cooking experience. This Pizza Megadome is identical to the Pizza Silverdome in its design and construction; it also incorporates our water jacket technology but has over 250 linear feet of stainless steel tubes. This wood burning pool heater packs a huge punch and produces delicious food. For those of you with large pools (i.e 20 x 40) that are accustomed to high heating costs, the Pizza Megadome is your solution to heating your pool cost effectively and at the same time utilizing the stainless steel wood burning pizza oven. 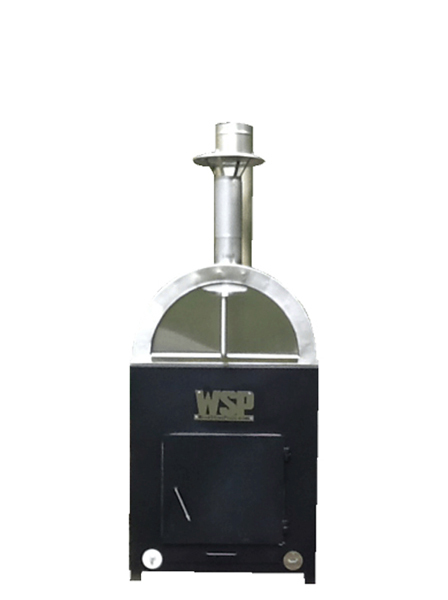 WSP has taken the popular back yard wood burning pizza oven cooking experience and combined it with our already proven wood burning pool heater. The patent pending design is turning heads across North America. The wood burning pizza oven is included in our WSP Pizza Silverdome (Lg+) & WSP Pizza Megadome (XL+) models. The size of the Pizza Silverdome & Pizza Megadome heat the most common size pools seen in North America, thus the reason we combined the wood burning pizza oven with these WSP models. Not interested in cooking with our 100% stainless steel pizza oven, then no worries simply keep the pizza oven door closed and let the pool heater rip. We will promise you one thing, the day you decide to use the wood burning pizza oven, it will be waiting for you at a nice 200-400 degree F temperature. The patent pending design uses the wasted heat that typically escapes out the chimney and keeps the oven at a constant cooking temperature of 200-500 degree F.
The double walled insulated chamber with ceramic refractory blanket allows the stove to remain at a constant cooking temperature of 200-500 degree F. The temperature probe installed on the pizza oven door will demonstrate that. The heat within the oven is controlled using the 2 damper vents, the 1stbeing part of the door construction and the 2nd being easily accessible on the back of the oven. The base of the pizza oven is a true masonry floor, which are refractory bricks, allowing a pizza to be cooked within minutes. The 2 inside grates have a dual purpose. 2. Allows for efficient distributed heat from the fire below, also referred to as “white oven cooking” The construction of the pizza oven allows for very fast heating times. You can be cooking within 30 minutes at 200-500 degree F temperatures unlike traditional clay ovens, which take hours and hours to heat up. Another attractive attribute of the only wood burning pool heater combined with wood burning pizza oven is the ability to cook using 2 cooking styles. Our manual includes some tasty recipes along with cooking techniques that will ensure you and your family are eating great tasting meals while enjoying your warm pool! Stay tuned as we will have frequent updates and videos of what our customer are cooking inside their wood fired ovens. Cook more then just Pizza! There is a lot more to these Pizza ovens then just pizza. We have done a bunch of slow roasting style meals with the white cooking method. Everything from chicken and ribs to briskets and vegetables. 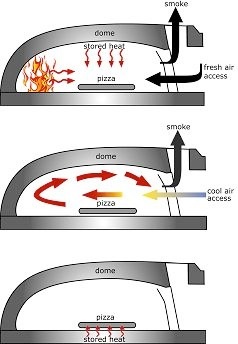 A diagram of how Black oven cooking works in our pizza ovens.